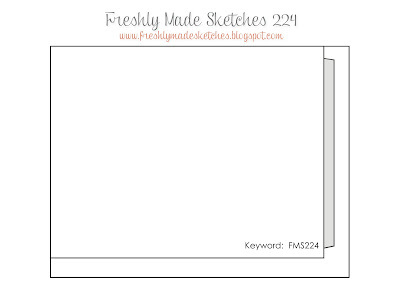 It's Wednesday and time for a new sketch at Freshly Made Sketches! My sweet friend Jen T. is the hostess this week and she has a simple sketch that is super versatile for everyone. I hope she forgives me for changing the orientation to portrait. :) I didn't have much time to make my card so I grabbed this panel I'd colored a while back, added a sentiment, and a little strip of Crushed Curry. Super simple. A couple people had asked about the stamps for this card. 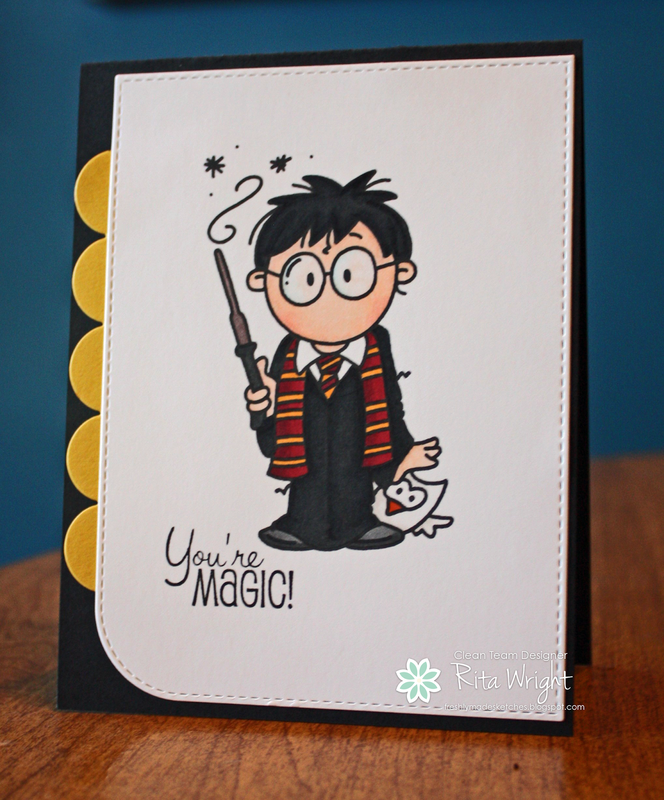 The Harry Potter is a digital one from Bugaboo stamps and you can find it here. The sentiment is from a set from The Cat's Pajamas called Presto. I hope that helps! This guy is adorable.....thanks to your magic! Cute card.....great pop of yellow! Hope you are all feeling better soon! I would love to know who makes Harry and where the sentiment came from. Hope your successful in fighting off the crud! I would love to know as well who made the stamp and sentiment! Great card. Thanks! Such a cute image and beautifully colored, as usual. Hope everyone is back to full health soon. I LOVE that image and it looks fantastic on the sketch! I love this image! And I have a fifteen year-old daughter who would probably be excited about stamping if I had one like this. I love how you colored it, especially the tie and scarf -- just like a true Harry Potter fan. I do hope you all are well! This is so fun - LOVE the rich colors - the pop of Curry is just right. This is such a great card Rita! I love the little Harry Potter! Great colouring (as always!)! Hope everyone is starting to feel better! 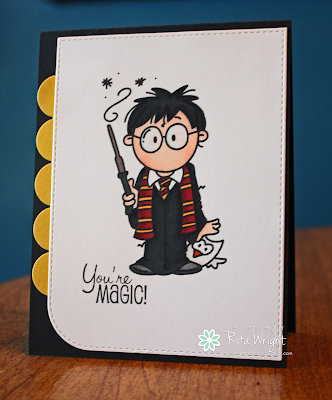 That image is awesome and not one I've seen before - such a fab card Rita! Your coloring is incredible, Rita! This couldn't be more perfect. I love this fun image and the large scallops are perfect with this! I love this card so much!! !